The Social Security Trust Fund is America's retirement fund. It also disburses benefits for the blind and disabled. The names of the two funds are the Old-Age and Survivors Insurance and the Disability Insurance Trust Funds. In January 2019, 68 million Americans received some Social Security benefit. 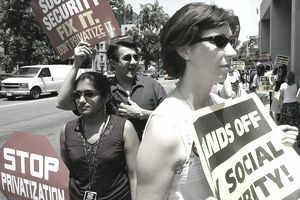 Almost all, or 90%, of workers paid Social Security taxes. The U.S. Treasury Department manages the Trust Fund under the direction of a six-member Board. Each July, the Board reports to Congress on the financial and actuarial status of the trust funds. Three sources of income fund Social Security. Workers contribute 85% through payroll taxes. Interest on the excess funds held by Treasury pays 11%. Current beneficiaries pay the remaining 3% through taxes on their benefits. The U.S. Treasury must invest Social Security income in "securities guaranteed as to both principal and interest by the federal government." The Treasury issues these special interest securities lie it does U.S. Treasury bonds. There are three differences. They are not tradeable, they are only available to the trust funds, and they are only bought with payroll taxes. The Treasury redeems these bonds, with interest, to pay for benefits. The money to redeem the bonds comes from the General Fund. After that, the payroll taxes go into the General Fund, where they pay for government expenditures. That's how presidents "borrow" money from the Social Security Trust Fund. The borrowed funds make their deficits look smaller. The real amount owed still shows up in the debt. It explains why the U.S. debt by president is larger than the U.S. deficit by president. For this reason, the Heritage Foundations says the "special issue" securities are "nothing more than IOUs." That's because future benefits will have to come from "taxes that are being used today to pay for other government programs." On August 14, 1935, President Franklin D. Roosevelt signed into law the Social Security Act. It created a program to pay an income to retired workers 65 or older. The funds for Social Security came from payroll taxes, known as FICA. The Social Security Trust Fund was established in 1937 to manage the income collected from these taxes so they could be redistributed as Social Security Income. Since then, the Trust Fund has received more in income than it's paid out in benefits. It's collected $20.9 trillion and paid out $18.0 trillion. At the end of 2017, it had reserves of $2.9 trillion. That's because of America's demographics. Until recently, there were 2.9 workers for every beneficiary. More money has gone into the fund via payroll taxes than has gone out as benefits. It's also been because of tax hikes and adjustments to benefits. In 1977, the payroll tax rate was raised from 6.45% to 7.65%. The Trust Fund has held a surplus since then. The Fund also receives interest income from its investments in "special issue" securities. The rate of return is determined by a formula enacted in 1960, and it changes each month. The average rate for each month in 2017 was 2.313%. But the average rate for all $2.9 trillion in Fund assets was 2.988%. The fund still holds bonds from past years when interest rates were higher. For years, the Board of Trustees warned that the demographic changes that created the surplus would also lead to the Fund's demise. As the baby boomers turn 65, leaving the workforce to retire, there will be fewer workers supporting more retirees. That increases the age dependency ratio. The financial crisis of 2008 hastened this trend. Higher unemployment meant even lower payroll tax income. In 2010, the Obama tax cuts, reduced the OASDI payroll taxes by 2%, while extending the Bush tax cuts. In fact, that was the first year that income from payroll taxes was not enough to cover benefits. The fund only received $544 billion from payroll taxes but paid out $577 billion in benefits. But its other income, from investments and taxes on the benefits, more than covered its costs. The fiscal cliff deal ended the 2% payroll tax holiday. Obamacare taxes on high-income households also began in 2013. That increased revenue to the Fund, and improved its cash flow shortfall. But the Tax Cuts and Jobs Act will reduce taxes again. By 2018, total costs of $1.003 trillion will be higher than total income of $1.001 trillion, according to Table IV.A3 of the 2018 Social Security Report. That will make it the first year since 1982 that Social Security contributed to the budget deficit. The situation will only worsen with the long-term demographic changes mentioned earlier. The Trust projects that its $2.9 trillion in assets will be depleted by 2034. At that time, the payroll tax income will cover 79% of the annual benefits. Different proposals are being developed to restore solvency. They require either a decrease in benefits paid, an increase in taxes, or an increase in debt. Since the debt is already unsustainable, policymakers are forced to choose between a tax increase or a benefit decrease. As a result, Congress has not made any real changes to restore the solvency of the Social Security Trust Fund.